Investing during times of uncertainty can be nerve wracking, but even in good times it can be problematic. For this reason, it’s useful for investors to keep a key set of things – call them rules – in mind. The key rules I think are to: make the most of the power of compound interest; be aware that there is always a cycle; invest for the long term; diversify; turn down the noise; buy low and sell high; beware of the crowd at extremes; focus on investments offering a sustainable cash flow; and seek advice. In the rough and tumble of investment markets its very easy to get distracted: by talk of the next best thing that will make you rich, by the ever-present predictions of an imminent crash, by the worry list that constantly surrounds investment markets relating to growth, profits, interest rates, politics, etc. The investment world is far from neat and predictable. The well-known advocate of value investing, Benjamin Graham, coined the term “Mr Market” in 1949 as a metaphor to explain the share market, but it also applies to most other investment markets. Sometimes Mr Market sets sensible share prices based on economic and business developments. At other times he is emotionally unstable, swinging from euphoria to pessimism. Mr Market is highly seductive – sucking investors in during the good times with dreams of riches and spitting them out during the bad times when all hope seems lost. This is particularly the case at present where noise around President Trump – often set off by a late night tweet - can set off market volatility and where this can be magnified by a digital media in which it seems everyone is vying for attention leaving the impression we are in a constant state of crisis and volatility. To help investors avoid being seduced by Mr Market there are nine key things to bear in mind. I haven’t written on this for a while but here is my list of the nine keys to successful investing. Investment markets – bonds, shares, property, infrastructure, whatever – constantly go through cyclical phases of good times and bad. Some are short term, such as occasional corrections. Some are medium term, such as those that relate to the 3 to 5 year business cycle. Some are longer, such as the secular swings seen over 10 to 20 year periods in shares. Some are even longer like the 35 odd year bull market in bonds since the early 1980s. But all eventually set up their own reversal. The trouble is that cycles can throw investors out of a well-thought-out investment strategy that aims to take advantage of long term returns and can cause problems for investors in or close to retirement. But they also create opportunities. One of the best articles on investing I ever read was by a US investment guy named Charles Ellis in the 1970s who observed that for most of us investing is a loser’s game. A loser’s game is a game where bad play by the loser determines the victor. Amateur tennis is an example, where the trick is to avoid stupid mistakes and win by not losing. The best way for most investors to avoid losing is to invest for the long term. Get a long term plan that suits your level of wealth, age, tolerance of volatility, etc, and stick to it. This may involve a high exposure to shares and property when you are young or have plenty of funds to invest when you are in retirement and still have your day to day needs covered. Alternatively, if you can’t afford to take a long-term approach or can’t tolerate short term volatility then it is worth considering investing in funds that target a particular goal. Don’t put all your eggs in one basket. A common approach in SMSF funds has been to have one or two high yielding popular shares and a term deposit. This could leave an investor exposed to a very low return or if something goes wrong in the share. 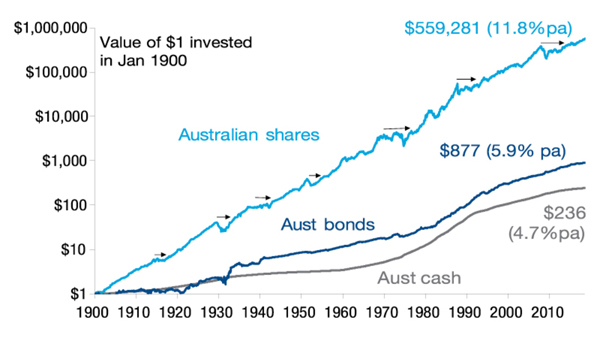 Through last decade many Australian investors wondered why hold global shares as Australian shares were doing so well. But this decade global shares have been the place to be reflecting stronger growth and the fall in the $A which enhances the value of offshore investments. Trying to get such swings precisely right can be hard so the trick is to have a diversified mix. But also, don’t over diversify as this will just complicate for no benefit. After having worked out a strategy thats right for you, it’s important to turn down the noise on the information flow surrounding investment markets and stay focussed. The trouble is that the digital world we now live in is seeing an explosion in information and opinions about economies and investments. But much of this information and opinion is of poor quality. As “bad news sells” there has always been pressure on editors to put the most sensationalised negative news on the front page of newspapers but there was hopefully some balance in the rest of the paper. But in a digital world each story can be tracked via clicks so the pressure to run with sensationalised and often bad news stories has been magnified. Hence click bait and all the talk about fake news. President Trump’s tweets are adding to the noise with markets sometimes jumping in response. He recently tweeted that “Tariffs are the greatest!” only to tweet 12 hours later in relation to the European Union that “I have an idea for them. Both the US and EU drop all tariffs.” Now I kind of get what he is saying and much of his utterances are bluster designed to get what he wants, but such gyrations cause confusion for investors. Of course, economists like to say more is preferred to less but when it comes to information and opinion around investment markets this is not necessarily the case. There is little evidence that the ramped-up news flow is helping investors make better decisions and hence earn better returns. We seem to lurch from worrying about one crisis to another. This year is seeing the usual worry list with worries about: US inflation, Fed tightening, global trade, Trump and the Mueller inquiry, the US mid-term elections, Chinese debt, Italy, the emerging world, increasing tension with Iran, tech stocks, etc. Investing now seems like a daily soap opera – as we go from worrying about one thing after another. This is all leading to heightened uncertainty and shorter investment horizons which in turn can add to the risk that you could be thrown off well thought out investment strategies. The key is to turn down the volume on all the noise. This also means keeping your investment strategy relatively simple. Don’t waste too much time on individual shares or funds as it’s your high-level asset allocation that will mainly drive the return and volatility you will get. What you pay for an investment matters a lot in terms of the return you will get. The cheaper you buy an asset (or the higher its yield), the higher its prospective return will likely be and vice versa, all other things being equal of course. So if you do buy or sell try to buy when markets are down and sell when they are up. Unfortunately, many do the opposite which explains the old saying that “flows follow returns”! Inflows to investment funds or markets are strongest after periods of strong returns and outflows are strongest after weak returns’ which is the wrong way around. At various points in time the crowd can be right and being in a crowd can feel safe. However, at extremes the crowd is invariably wrong. 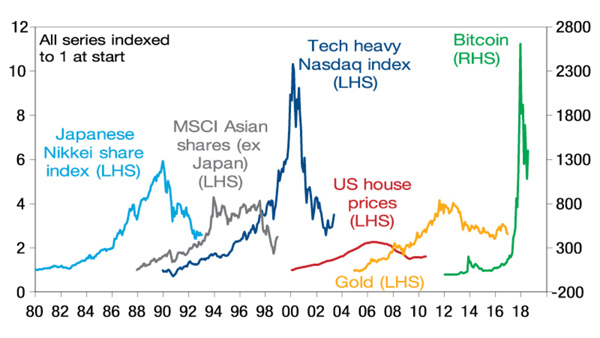 Whether it’s lemmings running off a cliff, or investors piling into Japanese shares at the end of the 1980s, Asian shares into the mid 1990s, IT stocks in the late 1990s, US housing and dodgy credit in the mid-2000s or most recently with Bitcoin which peaked last December just when everyone was talking about it. The problem with crowds is that eventually everyone who wants to buy will do so and then the only way is down (and vice versa during crowd panics). As Warren Buffet once said the key is to "be fearful when others are greedy and greedy when others are fearful". Lots of investments have been sold on promises of high returns or low risk but were underpinned by hope based on hot air (eg, many dot com stocks in the 1990s) or financial alchemy (eg sub-prime CDOs). But if it looks dodgy, hard to understand or has to be based on obscure valuation measures to stack up then it’s best to stay away. There is no such thing as a free lunch in investing – if an investment looks too good to be true then it probably is. By contrast, assets that generate sustainable cash flows (profits, rents, interest) and don't rely on excessive gearing or financial engineering are more likely to deliver. Given the psychological traps we are all susceptible to (like the tendency to over-react to the current state of investment markets) and the fact that it is not easy, a good approach is to seek advice via an investment service or a coach such as a financial adviser, in much the same way you might use a specialist to look after other aspects of your life like the plumbing or your medical needs. As with plumbers and doctors it pays to shop around to find a service or adviser you are comfortable with and can trust. But its worth it in the end. Even I have a financial adviser to help deal with the complexity of investing.